Hi everyone! 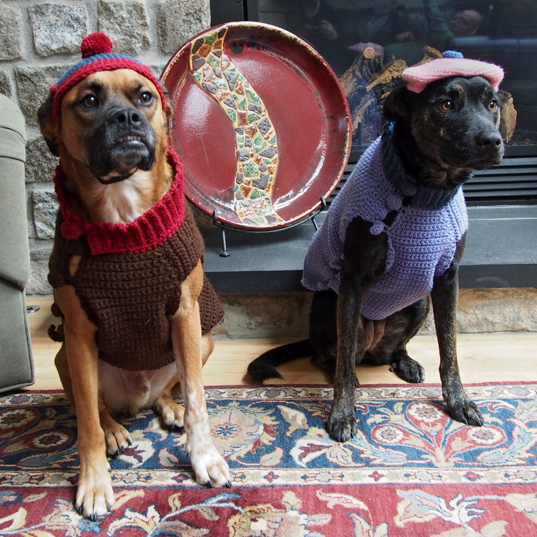 It’s Millie & Walter here to show you our Halloween costumes. 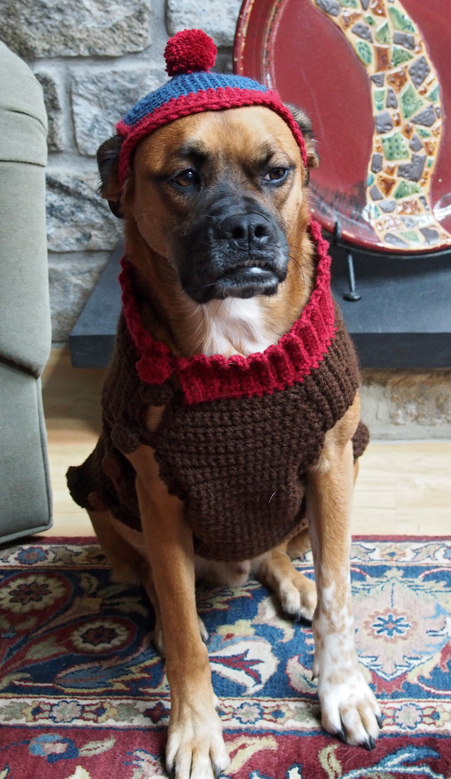 Just like last year our mom got it in her head that she could crochet something for us to wear and she did it. 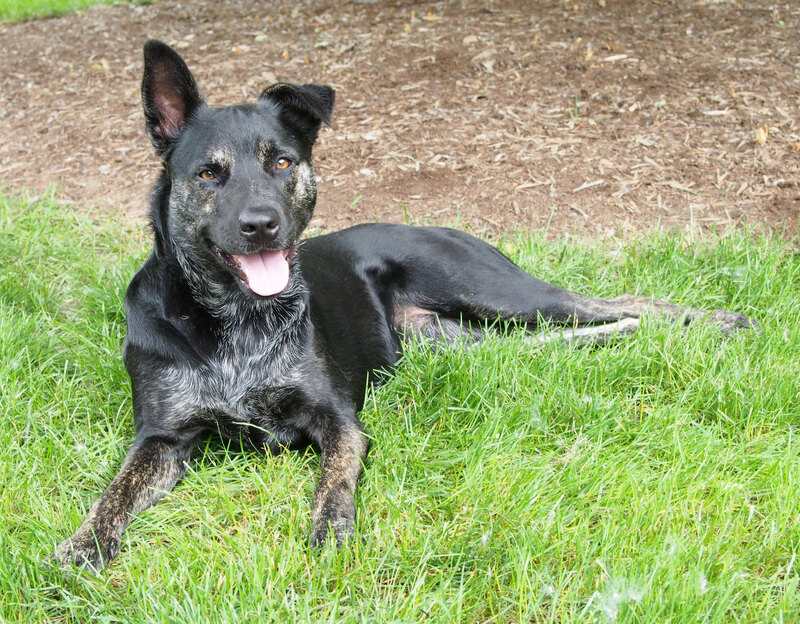 If you read yesterday’s post there is a hint as to who Walter is. 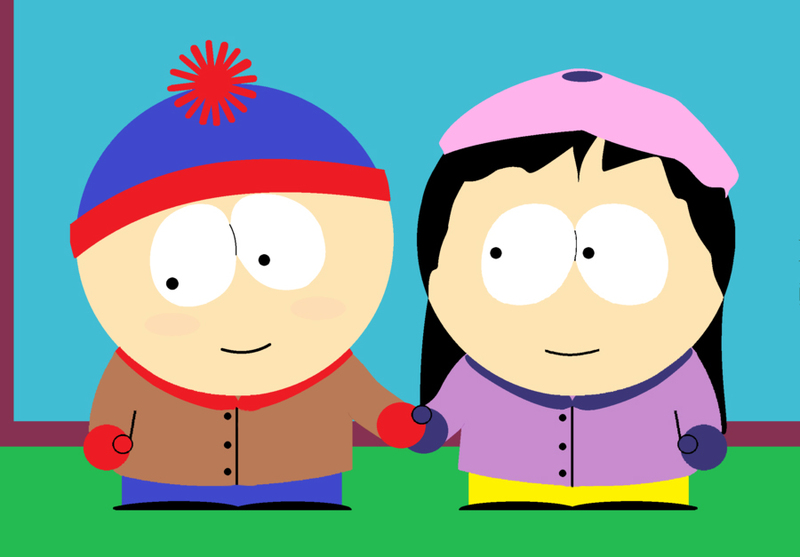 If you are a fan of South Park you might recognize the outfits to be the same as the only couple (other than the parents) on the show. Yep that’s right! Our mom tried to turn us into a couple of South Park characters. Now I, Walter, want to make sure that Tuiren doesn’t think that Millie is my girlfriend even though on the show Wendy and Stan are a couple. Yuck! She is just my sister and our pawrents are so obsessed with South Park right now that they thought it would be cute for us to be these characters. 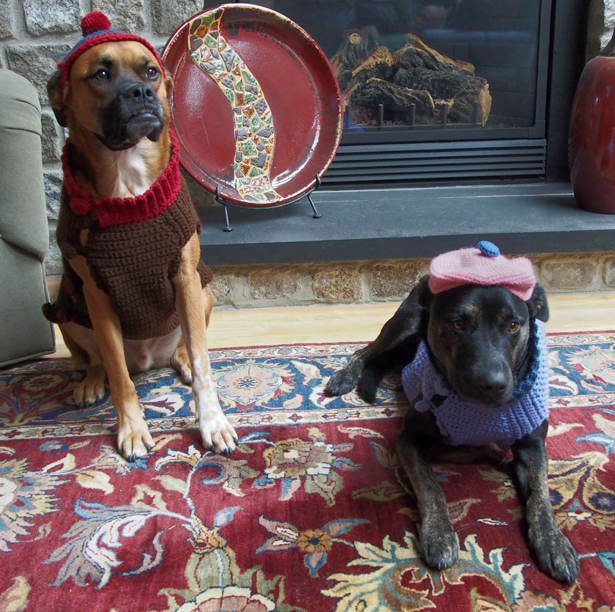 Mom made both of us sweaters with coordinating hats. Millie’s hat is a beret style with a button on the top. What happened to my ears? Both of the sweaters button down one side to make putting them on easier. 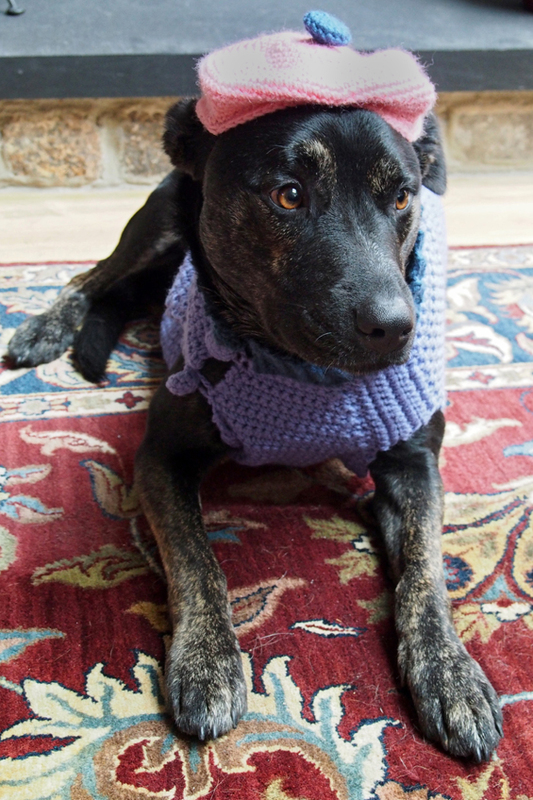 Our mom will do another post to bore you with the details of how she made the hats and sweaters. Let’s hurry over to Dory’s place for the party! Now that we are suited up we are heading over to Dory’s place for the big Halloween party. We didn’t get our pictures in to Dory on time but we sure can go enjoy a good time. See you there! Hi everyone! Sorry we haven’t been around much but our mom has been hooking like crazy to get us ready for Halloween. She finally finished our costumes just in time for the big day but not early enough to get our pictures to Dory for her big party. We will be there in spirit though and we think that is okay considering the holiday. BOL! You will have to wait until tomorrow to see who we dressed as this year. Now we have to tell you about some new friends the Mini’s made recently. Hi! I’m Stan (on the left) and this is Eric. Hey Stan I don’t think we are in South Park any more. That chipmunk is creeping me out. 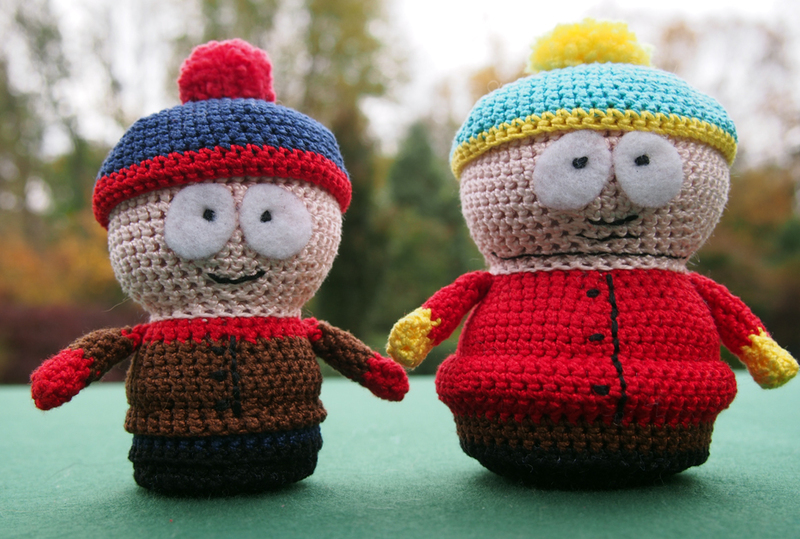 This is Stan Marsh and Eric Cartman. 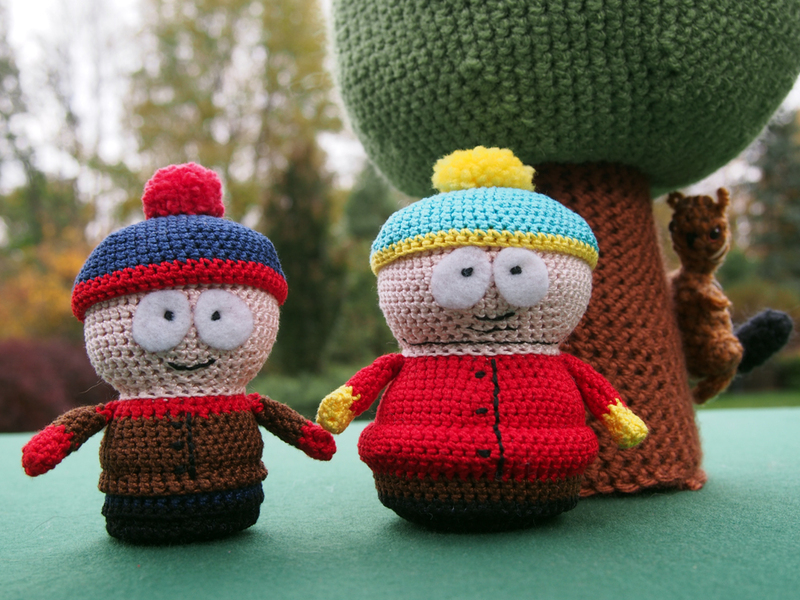 Two of the main characters from South Park. Hi Stan I’m Mini Millie! Hi Millie! Nice to meet you. Where are we? Hi Eric I’m Mini Walter. Hey Walter nice to meet you. You got anything to eat around here? These two mini’s have arrived off our mom’s hook. She has been working hard ever since she found some patterns on Etsy. She has the patterns for all the kids and will be working on more of them soon. This is her first real attempt at making Amigurumi which is how all the mini’s have been made. Our good friend Lynne made Mini Millie & Walter of course (although she isn’t making any new ones right now). Now we will let our mom tell you a little bit about them. 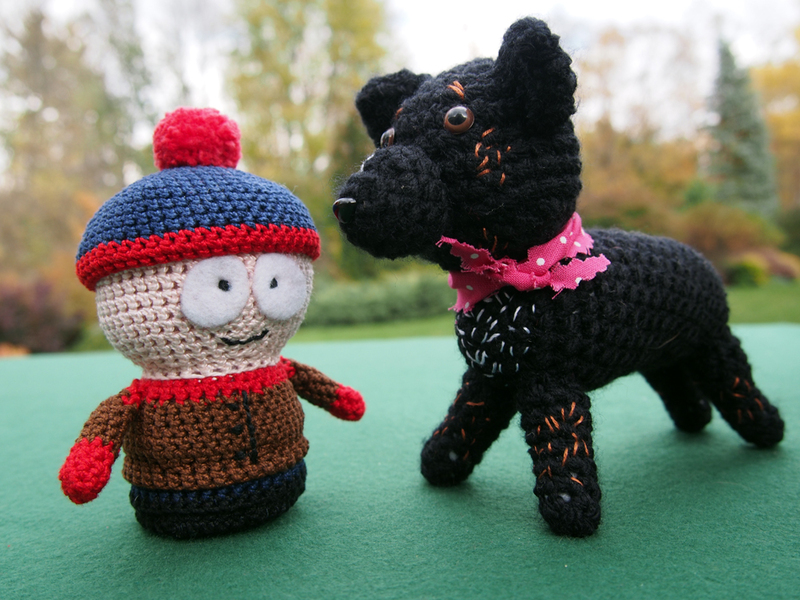 Stan measures in at about 4″ (or 10 cm) tall (not including the pom pom). 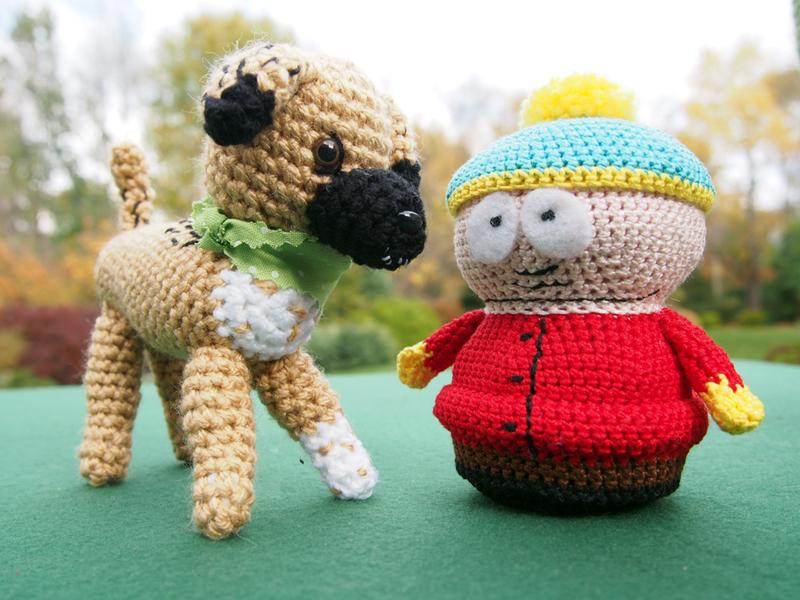 They are both made with size 3 crochet thread using a 2mm hook. 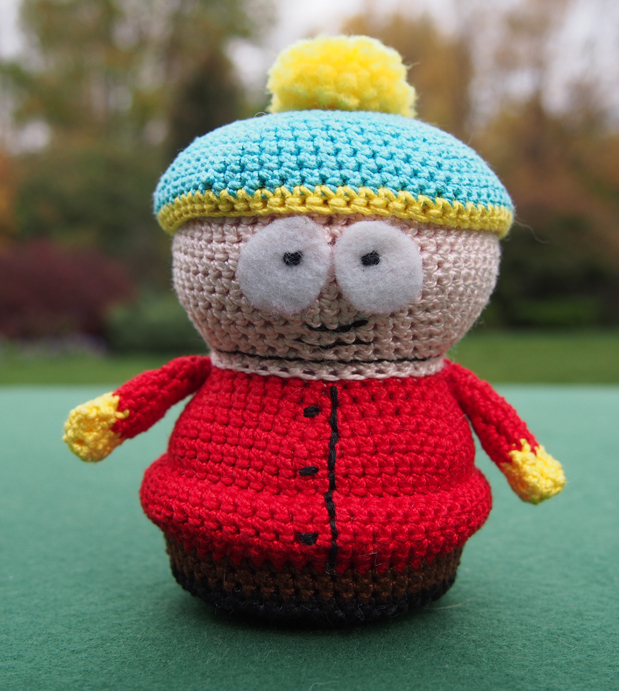 Cartman is a bit larger at 4 1/4″ (or 11 cm) tall (not including the pom pom). One of the most difficult things about making these was finding the correct size thread in all the colors needed. The patterns were created by a woman in Europe where thread crochet seems to be a bit more popular. After emailing the pattern designer I finally found Lizbeth size 3 cotton thread in a wide variety of the bright colors I needed. The only problem was that they didn’t have any flesh colored thread. After putting super searcher Charlie on the case he found Finca Perle Cotton that had a perfect pink for the skin tone. These don’t take a lot of thread to create but the Finca thread only comes in 10 gm balls with about 28 yards on them. The Lizbeth thread comes in 50 gm balls with about 120 yards on them. There are only a few United States outlets online where I could find either of these threads and at the time I bought the Finca I bought all 7 balls of thread they had in the flesh color. 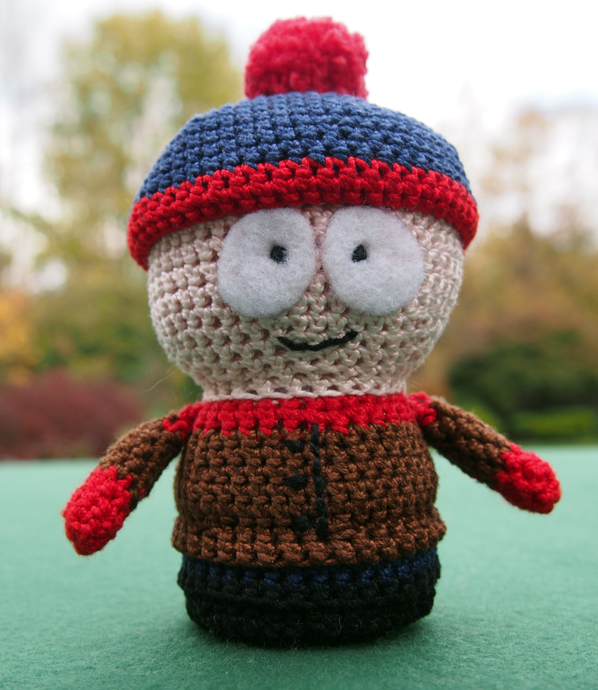 It took most of one ball to create Stan’s head and just over one ball to create Cartman’s head. This seems like a really cool place to hang out. We hope you can have some fun with us here. 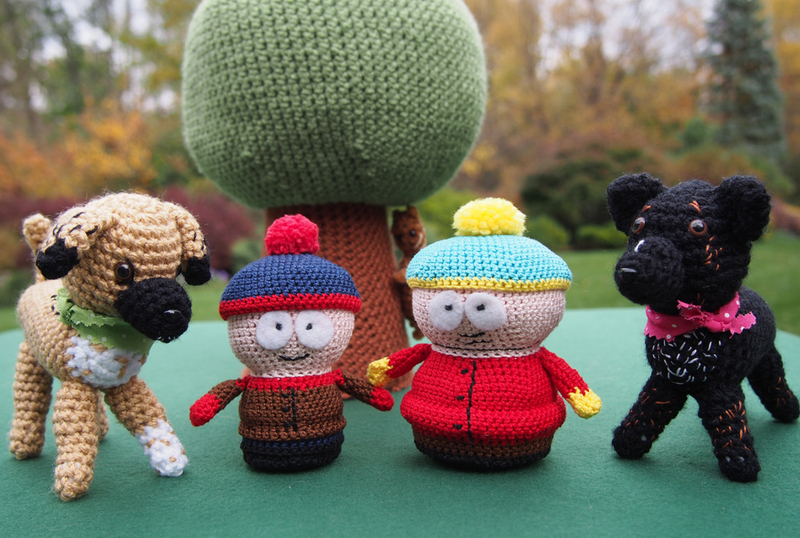 Now you might be wondering why this South Park obsession? Well up until this summer we haven’t ever watched even one episode of them but when everything else is in reruns you have to find something to watch. We started watching them on their regular channel Comedy Central and fell in love. After starting a Hulu plus account (mainly to watch movies) we discovered that every episode of South Park is available to watch through their service too. We didn’t quite start at the very beginning since we already had a feel for the characters but we have watched about 14 out of the 17 seasons so far and are watching season 18 as it unfolds each week this fall. South Park might not be everyone’s cup of tea. It is very crude and uses quite a bit of foul language but their social commentary is spot on. Anybody and everybody is fair game for a South Park skewering. I can’t wait to start hooking my next character. 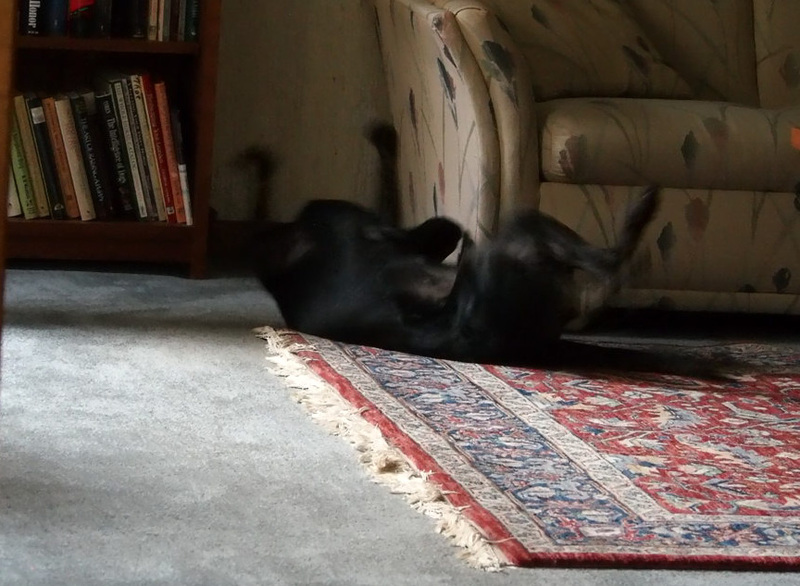 Mischief Monday – Caught in the Act! Do you remember a few weeks ago when I showed you what happened when I tried to record what Millie does after she eats a meal? Well I tried a different location that was out of reach on top of one of Charlie’s audio speakers but that still didn’t produce the desired results (I will have to make a blooper real from those and show you at a later date). 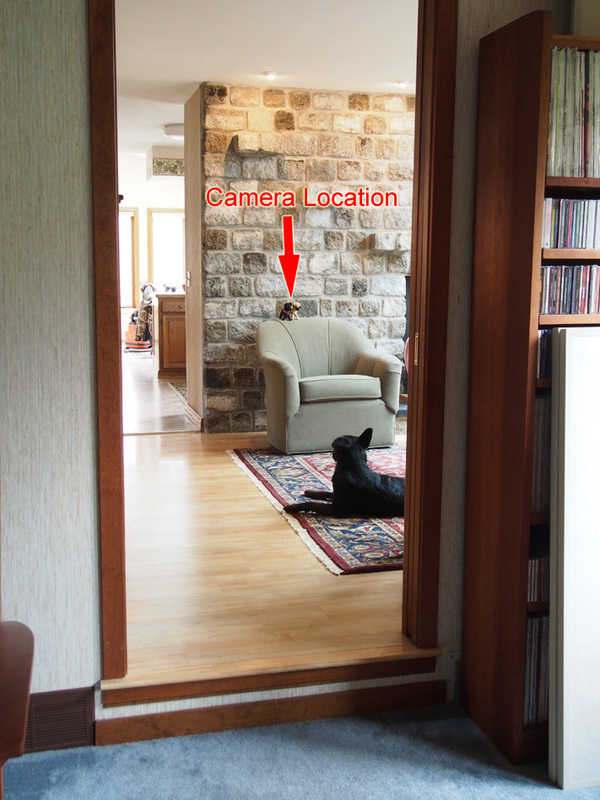 Charlie finally got the brilliant idea of putting a longer lens on the camera, using the zoom to get closer and putting it on a chair in the family room that has a clear view of her usual antics. You can see that I had to locate the camera quite a distance away. Here’s what happened. Be sure to turn up your volume to hear how loud her flop is. If you can’t see the video or want a larger view you can go here to watch the video. So there you have it! 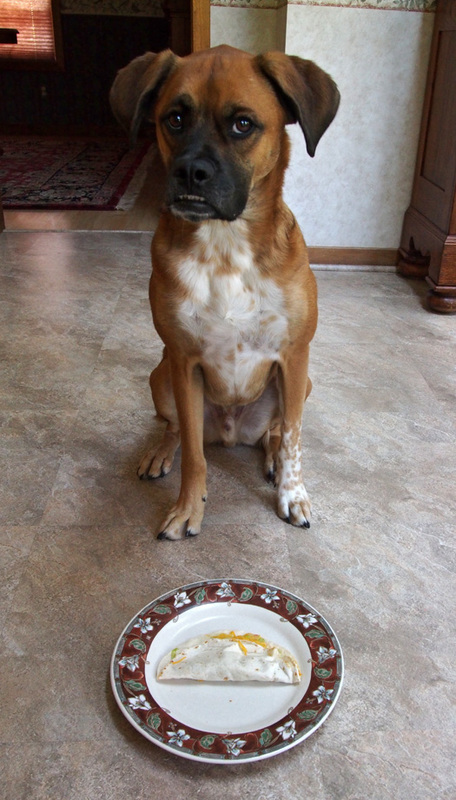 About 99% of the time after every meal Millie will run off to the living room to do this. She sure is a Silly Millie! Oh yeah! That feels good! Hi everyone! Sorry we’ve been absent. 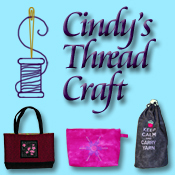 There is no real excuse other than I, Cindy, have been working hard on a few crochet projects and have not had much blogging time because of it. You can’t hook and use the computer at the same time (at least I can’t). I need to find an eye control system so I can do both. The stewartia tree, right outside our back door, puts on a beautiful show every year and the hickory tree is a great backdrop for it. 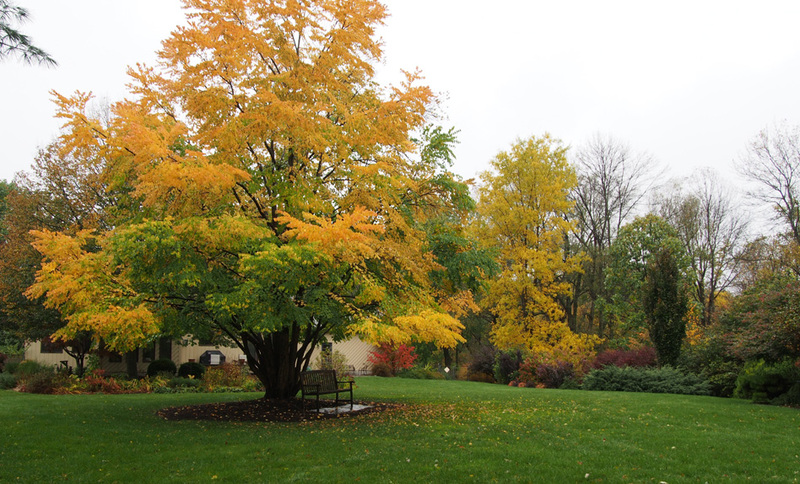 Here is another view of those trees with some of the neighboring shrubs. 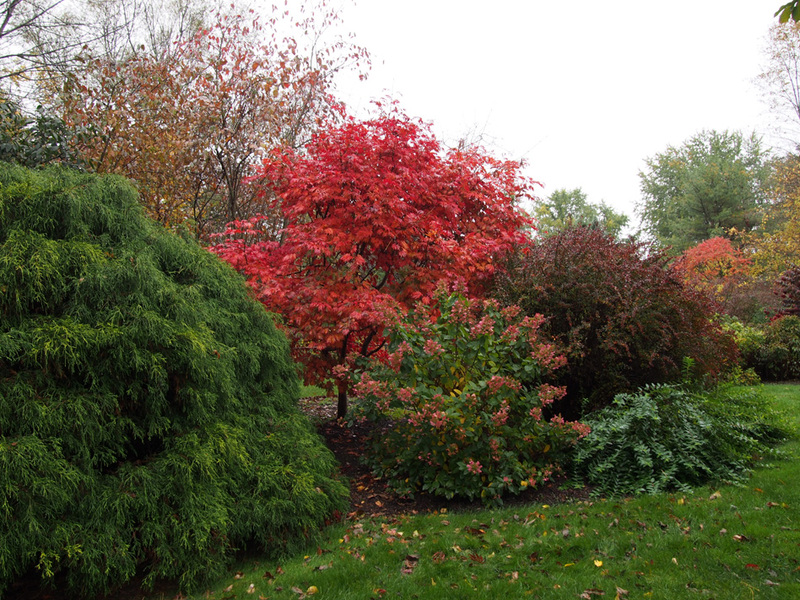 I love the contrast of the dark burgundy leaves of the shrubs with the hickory tree. 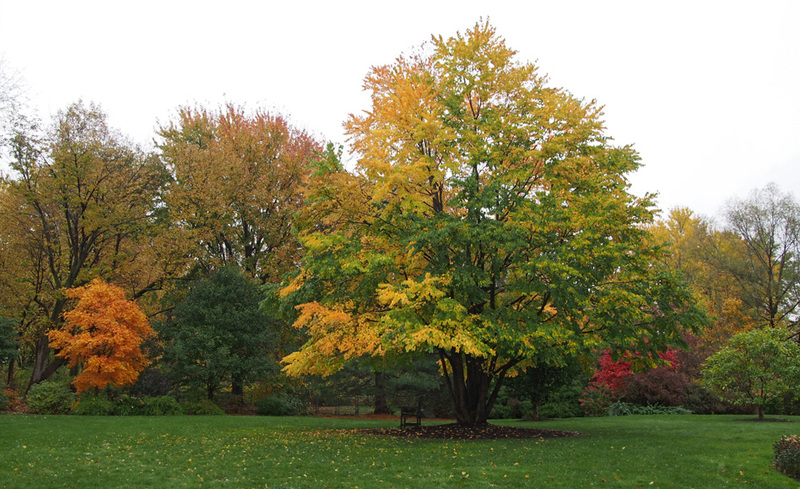 The katsura tree really stands out this year. 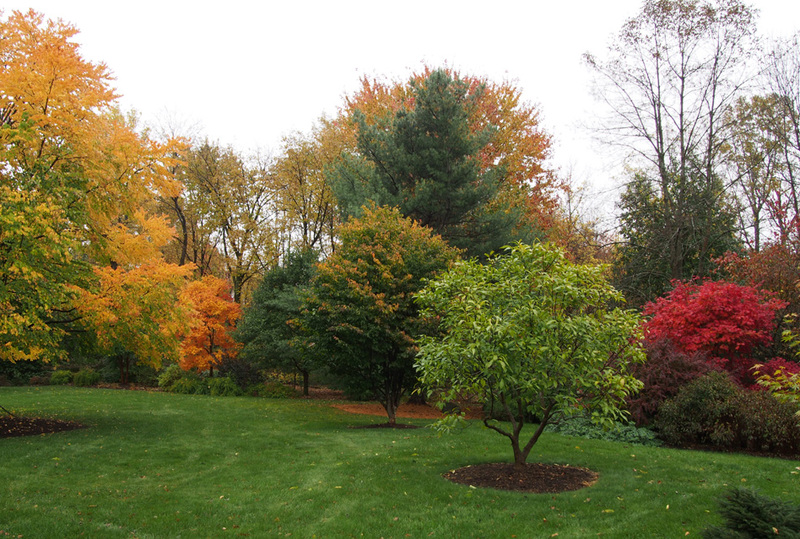 We don’t always get such beautiful color from it so this year is special. Looking to the east a lot of trees and shrubs are changing color. This Japanese maple is putting on a spectacular show and is complimented by the hydrangea and barberry. 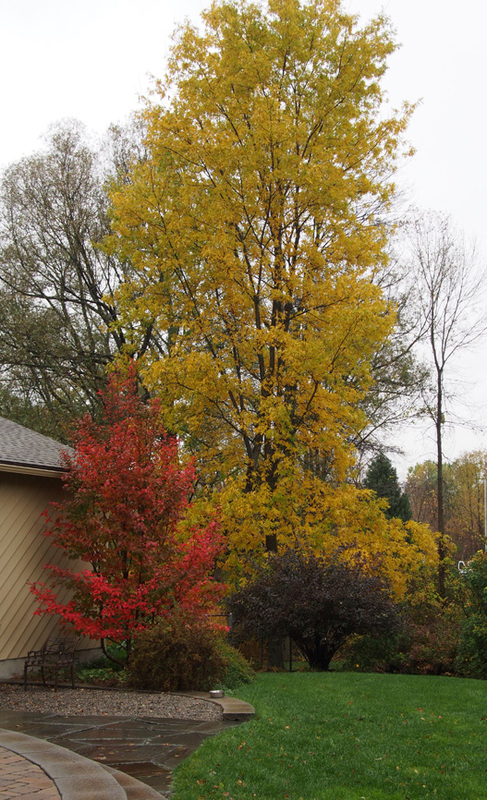 Last but not least is another view of the katsura tree (my favorite thing in our yard) with the triflorum maple in the background to the left displaying its beautiful fall color. 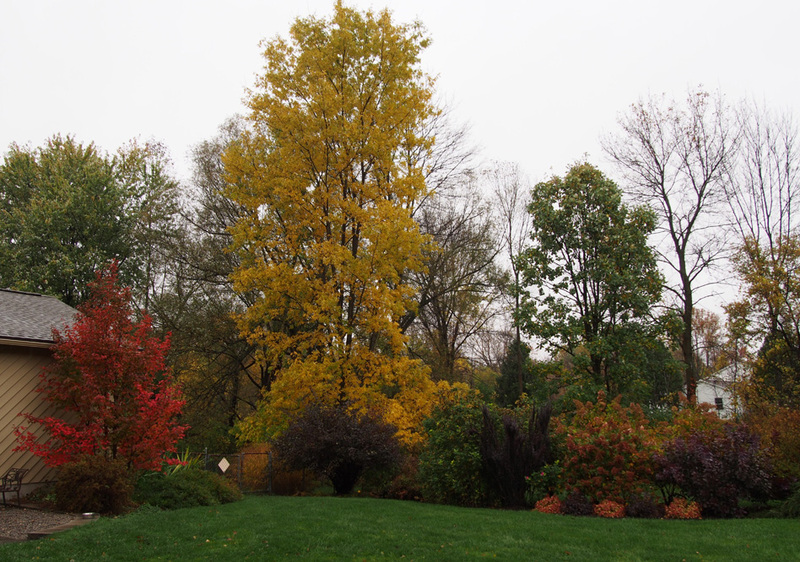 I hope you enjoyed this view of our fall foliage. If we have some more nice color I will be sure to share with all of you. Hi everyone! It’s Millie and Walter here. 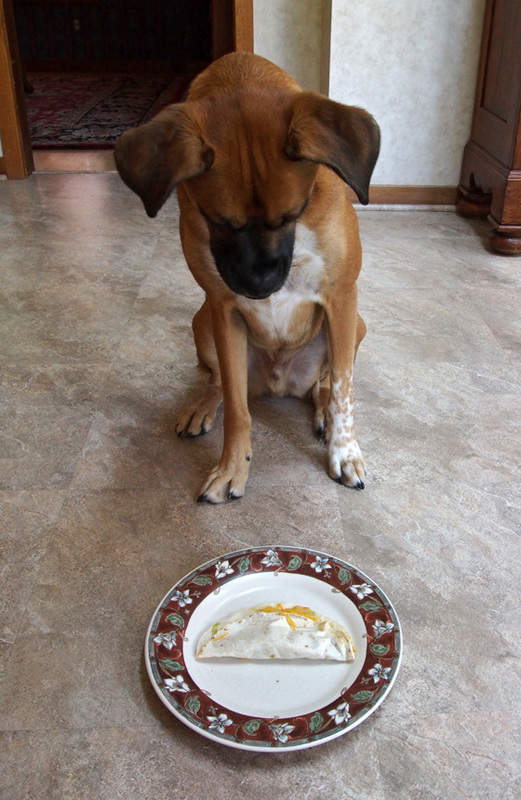 Today we are celebrating Jazzi’s International Taco Day! We missed out on this holiday last year, but there was no way we were going to pass it by this year. Miss Jazzi went to the Rainbow Bridge recently so we wanted to make sure we honored her memory perfectly. The first thing we did was send mom to Taco Bell for some real tacos. 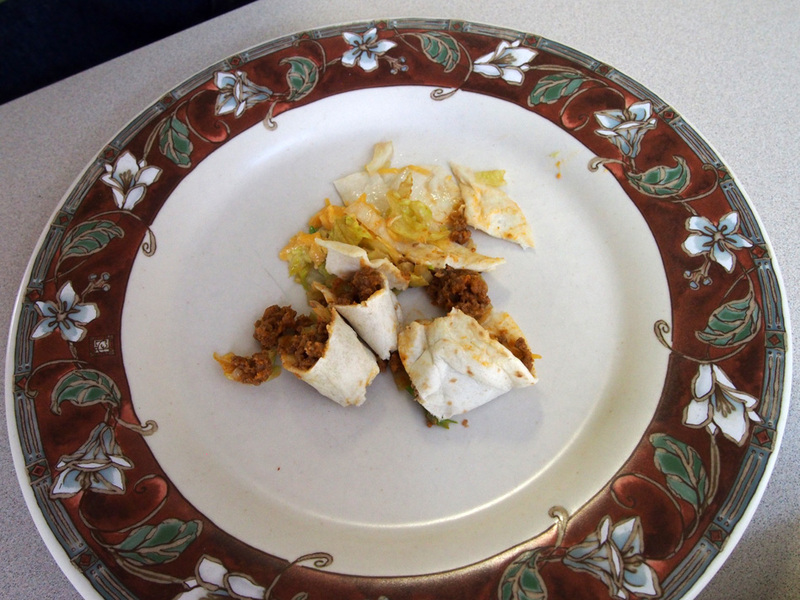 These were Miss Jazzi’s favorite and we always loved reading about how she would steal them right off the dinner table. It was always her sister Lori’s that would somehow get left unattended just long enough for Jazzi to sneak up on a chair and make off with the goods. OMD! Don’t those look delicious?! Of course our mom made us pose with them before she would let us eat them. I will sit for tacos! Yeah that’s right…mom always complains that she can’t get Millie to sit for her pictures. 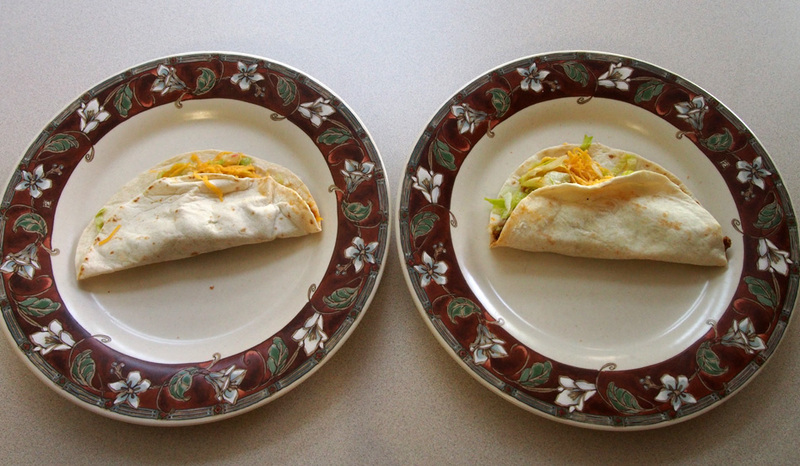 We guess she just has to put a plate of tacos in front of her from now on. BOL! Have to cut them up to slow Walter down. Finally! Let the feast begin! 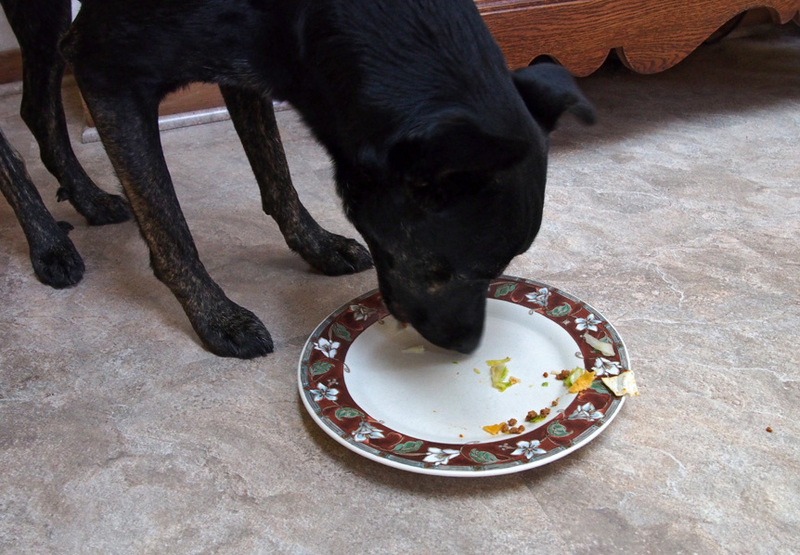 I like to fling my food off the plate. BOL! Wow! That was fantastic! 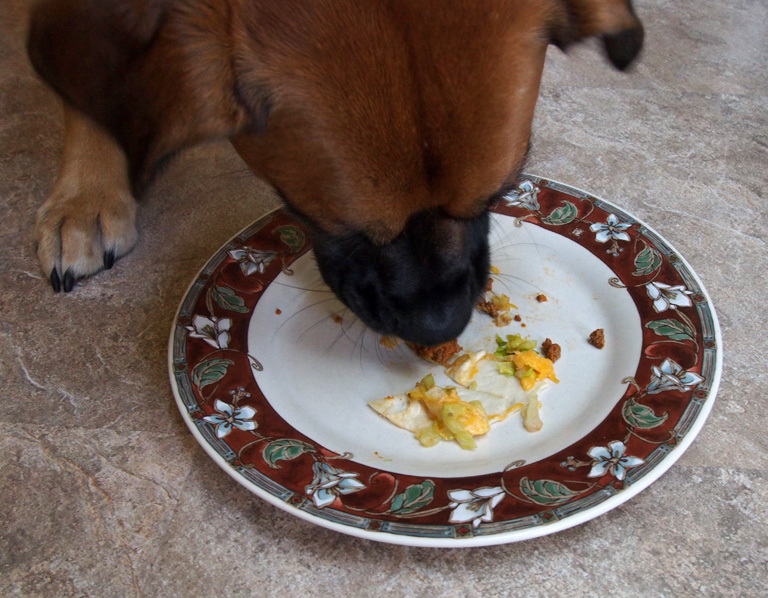 We’re so glad mom didn’t forget to help us participate in Angel Jazzi’s International Taco Day this year. We really miss Angel Jazzi but we know she and all our Angel sisters are enjoying all the tacos they can eat today and every day. Thank you Jazzi’s mom for keeping the tradition alive. He everyone! It’s Millie and Walter here. Today we are joining blog hop hosts Sugar, Dory and Oz the Terrier in celebrating World Smile Day. Our mom and dad tell us that we make them smile every day so we thought we would pass along a couple of our smiles to all of you. Playing with my Wubba always makes me SMILE! There is so much in Blogville that makes us smile every day too. We just love all our friends and love that you share your life with us. 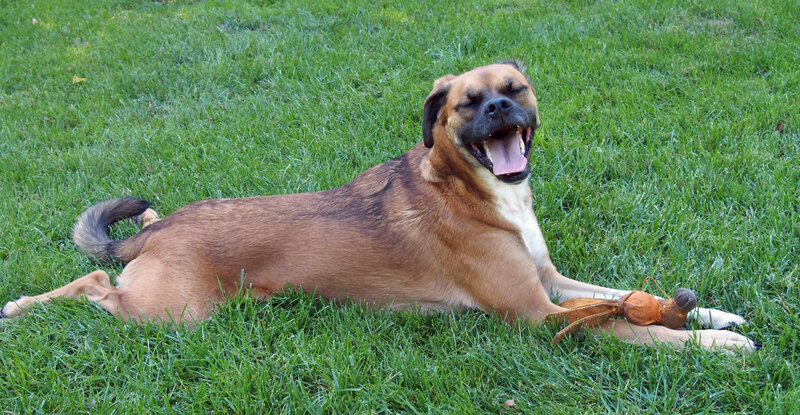 SMILES are contagious. Put one on and pass it along! We hope you have a great SMILEY day! Contrary to popular belief Cindy isn’t the only crafty one in our family. Like many men Charlie prefers to work with wood and use very loud power tools for his creations. We have lived in our home for over 24 years. 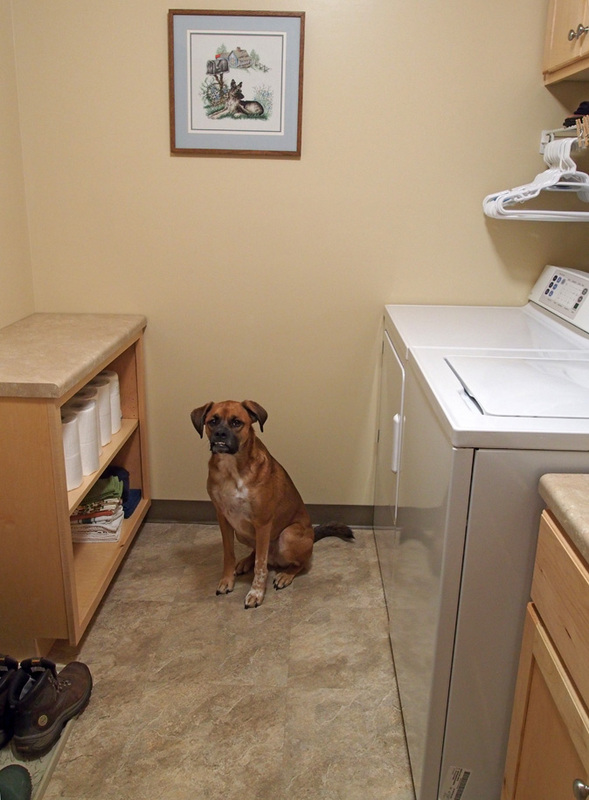 While our laundry room is not small (approximately 10′ x 7′) it has been pretty stark until recently. 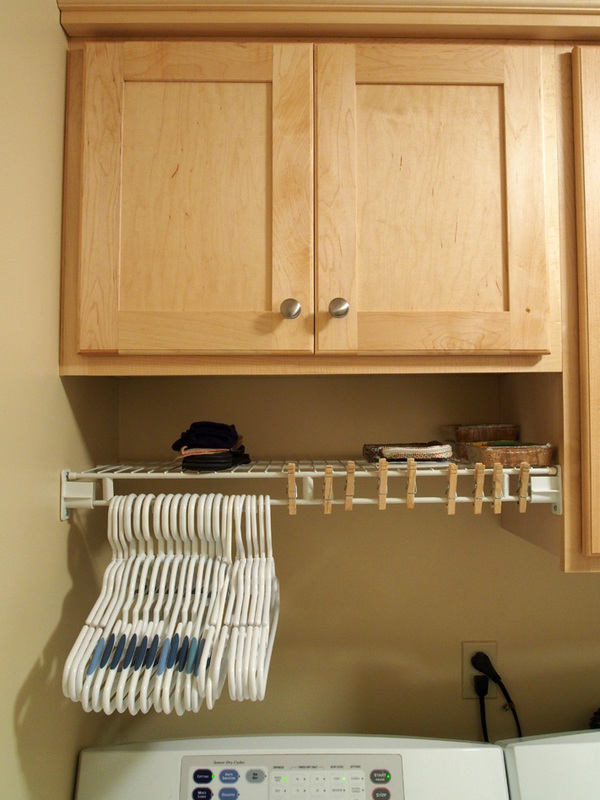 In addition to the washer, dryer, ugly utility tub and small freezer there was only a wire shelf for storage. Ugly utility tub similar to one we had. Of course I forgot to take any pictures before any of the makeover started taking place but I think you will agree that it looks pretty sweet now. 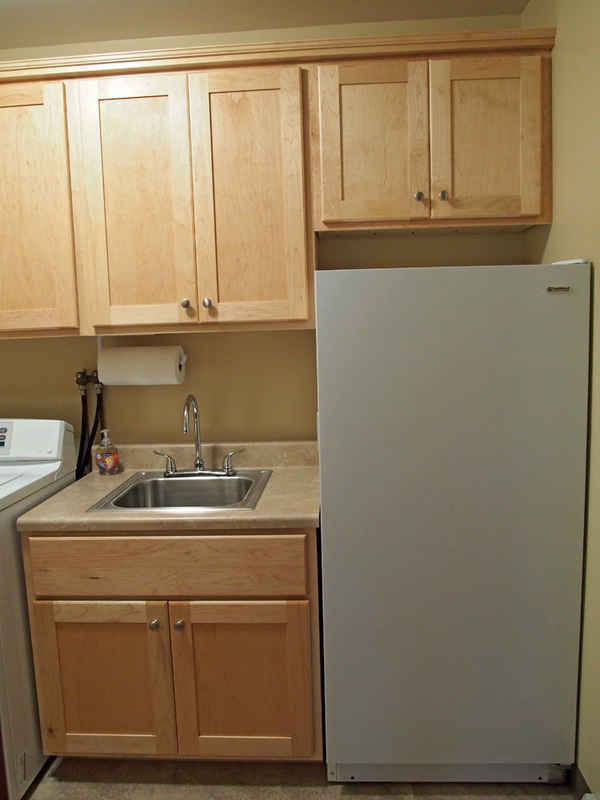 No more ugly utility sink and now there is a lot of storage. We had the plumbing for the sink professionally installed but all the cabinets were created by Charlie in his shop in the basement. 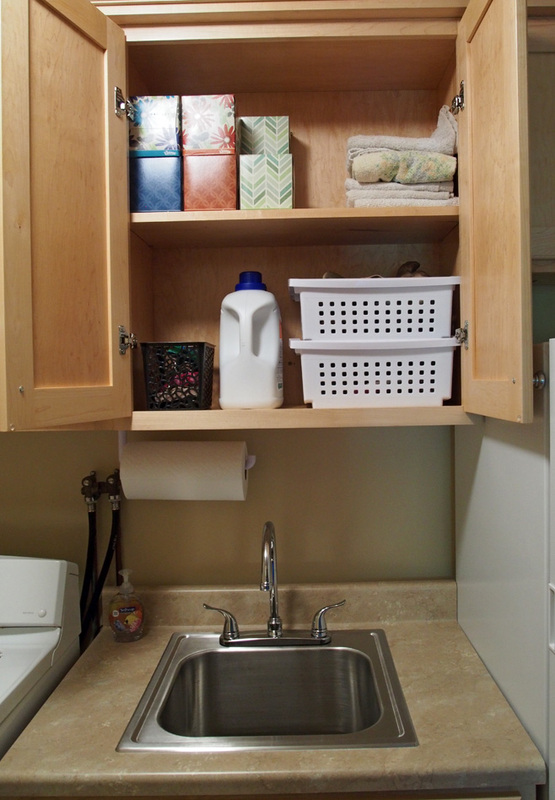 The Formica sink top was cut from a 6′ long prefabricated top that can be purchased at your local big box store and not an inch of it was wasted because the remaining piece was used to make the cabinet below. 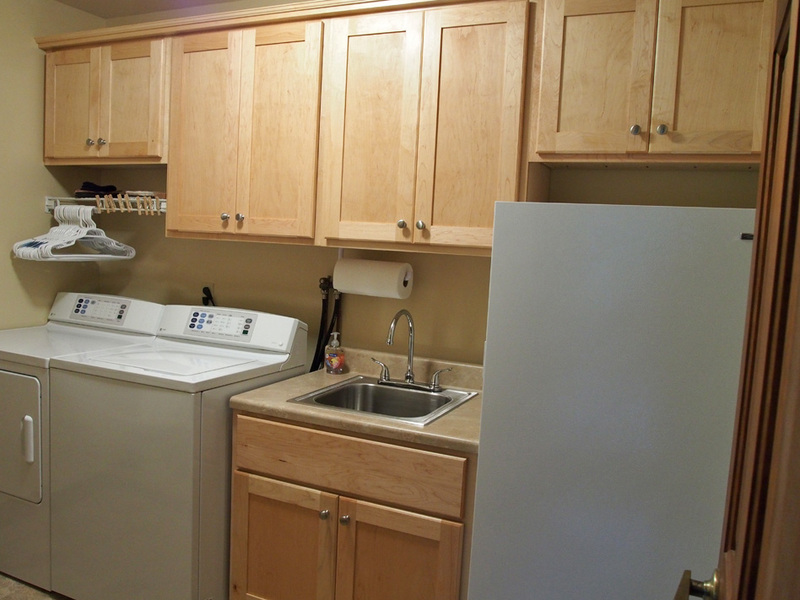 The laundry room is wide enough that there was also room for a free standing base cabinet opposite the washer/dryer. 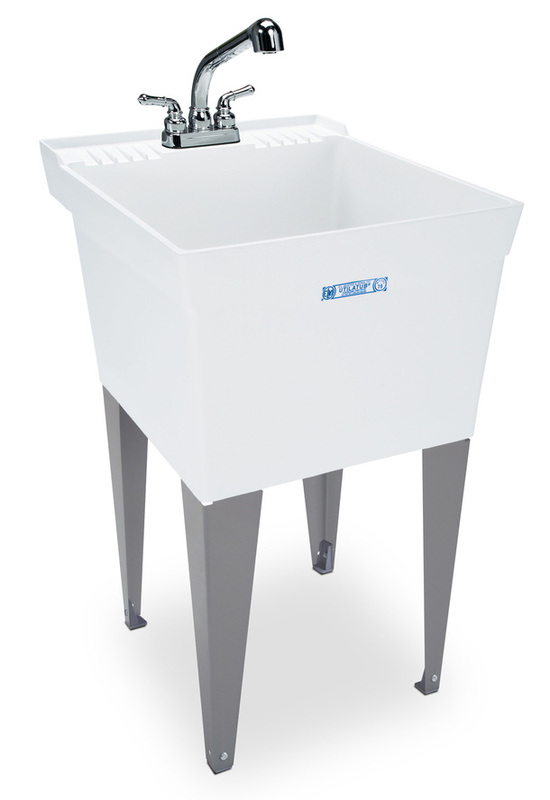 It is not only great for storage but it is the perfect width for laundry baskets to sit on. 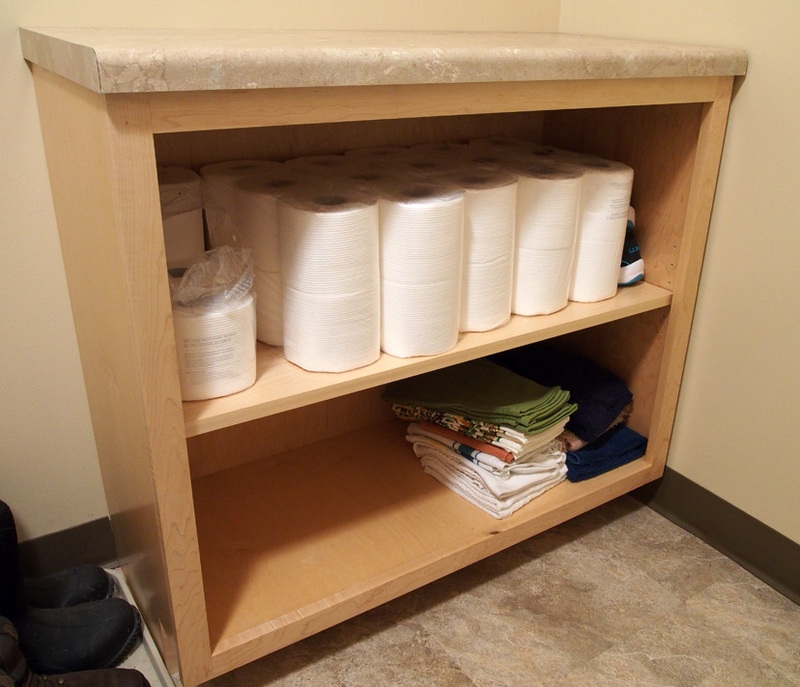 The cabinets are made from maple veneer plywood and solid maple wood with solid maple shelves. The doors have European style hinges and satin finish stainless steel knobs. There is still a remnant of the old wire shelf above the dryer to hold hangers and allow for some space to dry small things. I love all the cabinets and Charlie did and amazing job. The only downside to the new cabinets is that when the washer is running it is a bit louder since there is more for the sound to bounce off but nothing closing the door can’t fix. 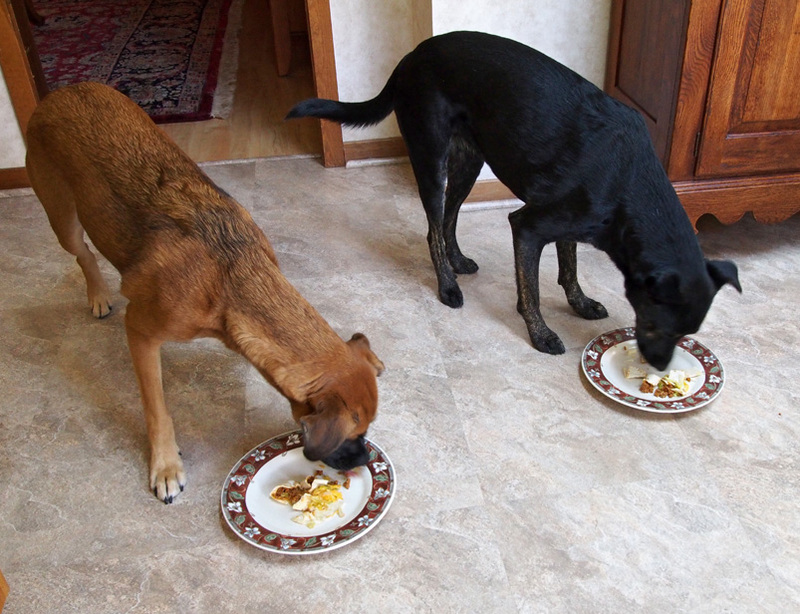 Were is our water dish? 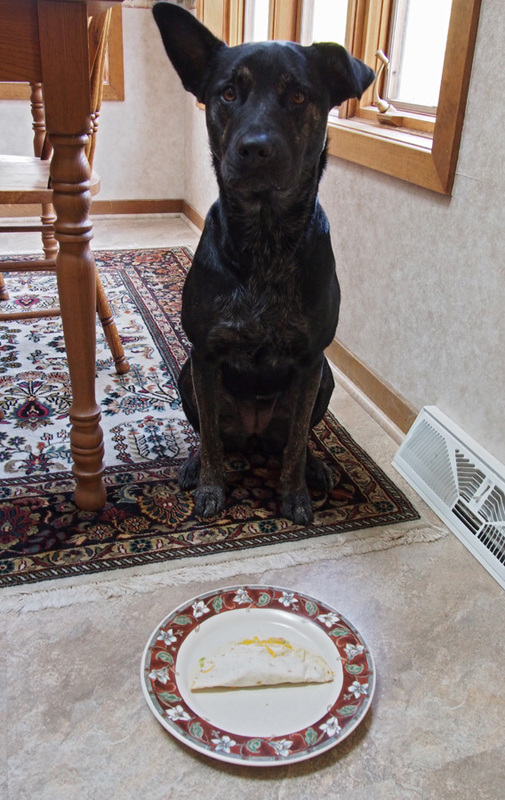 Now don’t worry Walter your water dish is right where it has always been right next to that boot tray.